Try as hard as you like, but in the end only the language of the heart can ever reach another heart, while mere words, as they slip from your tongue, don’t get past your listener’s ear. “Only the language of the heart can ever reach another heart.” When someone is hurting it is amazing how empty our words can be in comparison to the touch of a hand. Have you ever noticed that when someone is being consoled after a loss, the person grieving will very often hold themselves together until they receive from someone a touch of the hand or an embrace, then the heart breaks and tears begin to flow. 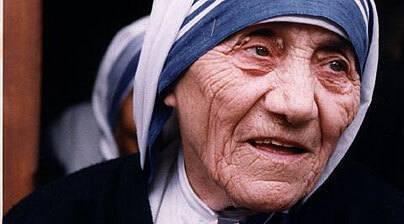 I remember once offering my sympathy to a lady, and she said to me “please don’t be kind to me or I shall break”. This lady had a daughter who was very ill and she was doing her best to be strong for them both. 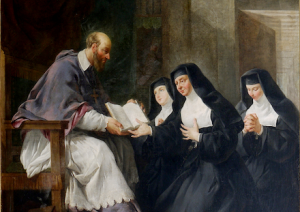 I continued to talk with her for some time, but not as St Francis de Sales puts it, with “the language of the heart,” in other words, she needed to talk, to share her burdens, but she did not want sympathy or compassion shown at that time. I once read the story of person who had a “near death experience,” (NDE) she had clinically died for several minutes before being revived. During this time she had the common NDE of going through the tunnel of light, visions of her whole life etc. But what was less common in her experience was that she went further, she met with Jesus and had a conversation with Him before being sent back, returning to her body. During her talk with the Lord He showed her different aspects of her life, what she had done that was important and that which was unimportant. The conversation amazed her because He showed her what He considered to be the most meaningful act of her life: one day she had seen a lady in tears, she stopped, and not knowing what to say to her, she simply put her hand on the ladies arm. That was it! That was the most meaningful act of her life in Jesus’ eyes. St Francis de Sales also writes: “There is nothing small in the service of God”. We can never underestimate the value of a smile, an embrace or a small service done for someone. It is amazing how the little things matter and have great value in the eyes of God. Mother once had a volunteer helping who did not understand this, he could not see Jesus in the sick and dying people in the home. One day Mother asked this man to carry a dying man into the other room. As he carried him in his arms down the corridor, he passed a statue of the Pieta (that is the statue of Mary cradling the lifeless body of Jesus, at the foot of the cross) The man looked at the lifeless body of Christ and then at the dying man in his arms, through a sudden revelation he realised the truth in Mother’s words. Mother would say, “The work is only the expression of the love we have for God.” She believed that the greatest poverty a person could suffer was the poverty of love, and the worst disease a person could suffer was to be unwanted, and there was no cure for this disease except hands that were willing to serve and hearts that were willing to love. Mother would say, “Every person is Christ for me, and since there is only one Jesus, that person is the only person in the world to me at that moment.” This is the language of the heart and only this language can reach another person’s heart. Like Mother Teresa we are the face of God upon the earth, let us be His arms that embrace, His guiding hand and His loving smile for everyone. This entry was posted in Encouragement and tagged contemplation, meditation, spirituality, stories. Bookmark the permalink. This website is awesome. As a lay Catholic I will continue to visit this website to enrich my knowledge. Thank you so much!